Website of the Week: Our Valued Customers. DC Comics claims Monthly’s are dying, Graphic Novels are the key to the future. Obscene and Heard, new game: The Marvel Brothel. Fringe – The Number Stations. The Walking Dead renewed. Zombies would clap if their flesh didn’t rot off. Casting Rumor: Zooey Deschanel as Betty Brant in the new Spiderman. Fan Film Mash-up: Ender’s Game trailer. Timur Bekmambetov’s Alternate History: Apollo 18. Order Browncoats: Redemption by December 1st in order to get it in time for the holidays. Use the coupon code SFSN2010 for $2 off. Our Guest tonight Samantha Boyette, TextNovel 2010 Grand Prize Winner of the Online Fiction contest for her novel Prime and author in Last Man Standing Anthology . She reads from her short story, Life of A Child, talks about her creative process and lets us in on what’s upcoming for her. 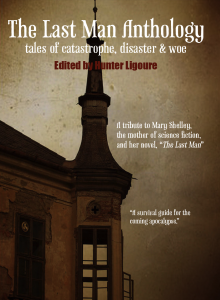 To be entered to win a copy of The Last Man Anthology, edited by Hunter Ligoure, with a short story by Samantha Boyette, simply make a comment below about tonight’s show. One incredibly lucky listener will be chosen at random from the myriad listeners across the multiverse. It could be you. You can obtain a copy of The Last Man Anthology here. If you enter the coupon code ATLANTIS1, you will receive a $ 3.00 discount simply for listening to Sci Fi Saturday Night. I enjoyed hearing from Samantha last night and hope she has great success with her future writing. Combining good character development with horror/sci-fi is something not many do well, so I applaud her for that. Thanks for having her on the program. Number stations are neat, I remember listening to them back when I was into ham radio and shortwave. It’s pretty clear that they’re some kind of coded message system. I was pleased to listen to Samantha Boyette’s interview. As an aspiring writer, it’s refreshing to listen to a writer who has enthusiasm for the business and practice of writing. Great episode. PS: Been listening since I first discovered the Harlan Ellison interview in July, and have listened to many older episodes during my long days at work. I know I’m very late with this but… bazinga! I’m bringing it back.